This year we are seeing our youth take an active role in the future of this country. Our student leaders are evolving into advocates for a just and responsive government and they are inspiring us on the way! 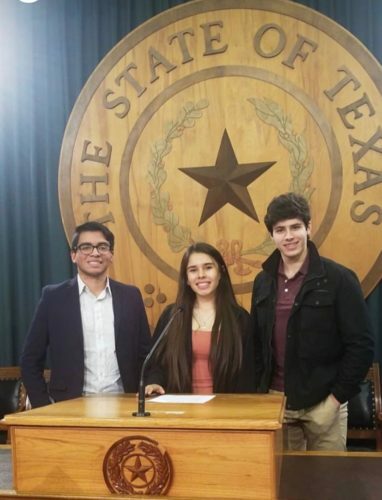 On January 16, 2019, three Houston youth leaders visited the Texas state capitol in Austin to witness and participate in the state’s legislative process. The trio (Juan Venancio, Vanessa Perez, and Adam Touzani) began their trip from Houston at 5:45 AM and documented their experience through our MFV Instagram, tagging their Texas representatives during their IG Texas takeover. “By repealing the Texas Dream Act, we would be discouraging youth from attending college simply because they cannot afford it. The proposal aims to cripple a community of driven individuals by limiting opportunity and enacting barriers instead of opening doors. Of course, these students will suffer the most from this repeal, but we would be doing a disservice to Texas as well. Texas state representatives present at the event publicly saluted the students for their young leadership. The legislative policies we adopt will impact their future; our youth are taking an active role advocating for a just and responsible government.